The abominable snowman was arrested for drunk driving. 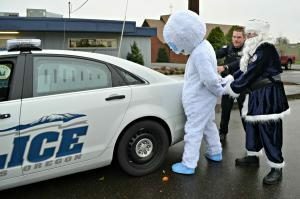 The ‘arrest’ of the snowman was part of a campaign by the St. Helens Police Department to crackdown on drunk driving during the holidays. Although the arrest was fake, the message was real: DUI/OVI enforcement is increased during the holiday season. The holidays bring an increased volume of driving. According to AAA, holiday travel has increased consistently over the last nine years, and this year looks to be record-setting. In Ohio, nearly 4.5 million people are traveling for the holidays, and 90% of those are driving. The holidays also bring an increase in accidents related to operating under the influence. The National Highway Traffic Safety Administration (NHTSA) reports that, over the last five years, an average of 300 people died in drunk driving crashes during the week between Christmas and New Year’s Day. In Ohio last year, ten OVI-related crashes resulted in 13 deaths during the Christmas holiday, according to the Ohio State Highway Patrol. The concern about increased drunk driving results in ramped-up OVI enforcement at this time of year. Law enforcement agencies across Ohio add OVI saturation patrols and OVI checkpoints. On a national level, NHTSA has resumed its annual ‘Drive Sober or Get Pulled Over’ holiday campaign urging Americans to refrain from drinking alcohol and driving. If you are incapable of planning, ahead, and you don’t own a smart phone to summon a ride, drink in moderation. You probably don’t know when you are getting close to .08 BAC, so don’t take chances. Oh, and buy yourself a smart phone for Christmas and download the ride-sharing apps. Paying for a ride, or your friend’s dinner, is much less expensive than paying for a DUI/OVI lawyer. Unless you really want to help put my child through college, don’t take the risk of getting arrested for DUI/OVI this holiday season.